THE AMAZING APPLE has traveled back and forth across America since its arrival in New England in 1623, and nearly half of the United States have produced apples currently cultivated in New England. 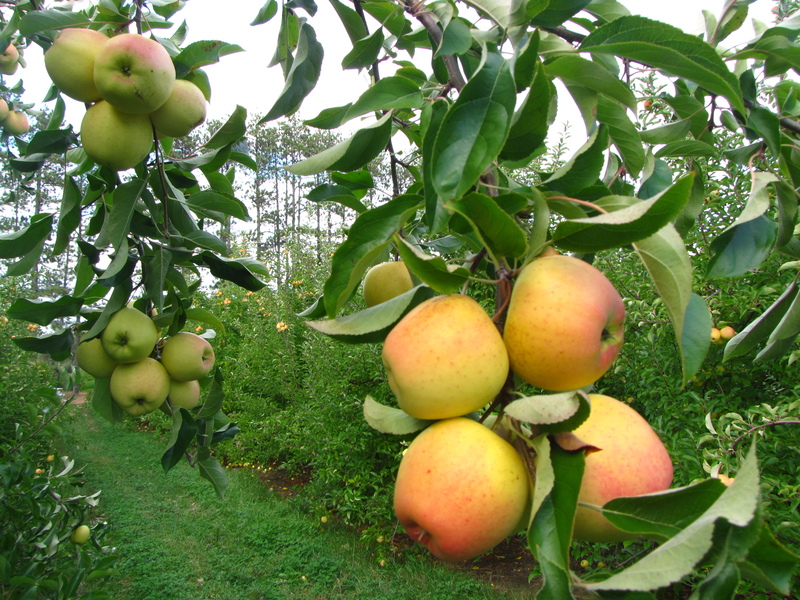 In addition to natives of the six New England states, previous posts in this series have highlighted varieties from apple-breeding programs in Minnesota, New York, and a consortium of the University of Illinois, Purdue University in Indiana, and Rutgers University in New Jersey (PRI). While not exhaustive, this list (and the links above) represents the vast majority of apples grown in New England orchards that were discovered in other states. To find out more about where these apples are grown, visit New England Apples and choose “Find An Apple Orchard” to search by map, state, zip code, or variety. 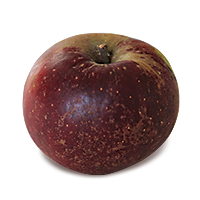 Arkansas Black (Arkansas Black Twig) is a round, deep red, conical apple with heavy skin and dense, cream-colored flesh. It has a spicy flavor, more tart than sweet. A late-season apple, Arkansas Black is widely used for processing and cider making. It stores exceptionally well, and its skin naturally darkens in storage. There are conflicting reports about Arkansas Black’s origins, but both stories trace the apple to Arkansas’ northwest corner around 1842. One account attributes it to Mr. Brattwait of Benton County, while another claims it was discovered on the farm of John Crawford in Washington County. Introduced around 1870, it is the result of a cross between a Winesap and an unknown apple. 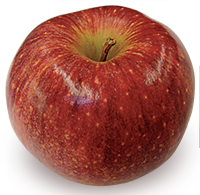 Ben Davis is a late-season apple, roundish, mostly red or red-striped over a rather tough, yellow skin. Its tender, cream-colored flesh is aromatic and juicy, and it has mild flavor, more sweet than tart. It stores exceptionally well. Ben Davis dates back to the early 1800s. Its discovery is credited to three southern states, none definitively, but it had spread throughout these states and other parts of the South and Midwest well before the Civil War. It is not widely grown in the Northeast, but it is a parent of one of New England’s most popular apples, Cortland. 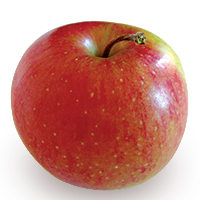 Idared is a large, round, late-season apple with a chewy, ruby-red skin. Its crisp flesh is white with a green tinge. Idared’s flavor is more tart than sweet when first picked, but it develops sweetness and complexity and becomes juicier over time. After a month or more in cold storage, it becomes a superb apple for sauce, pies (it holds its shape when cooked), and cider. Idared, a cross of Jonathan with Wagener, was discovered in 1935 by Leif Verner, head of the Department of Horticulture at the Idaho Agricultural Experiment Station in Moscow, and released commercially in 1942. 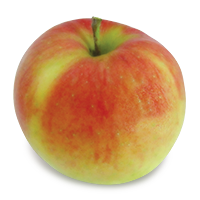 Blushing Golden (Stark’s Blushing Golden, Goldblush) is a yellow, conical, late-season apple with a pink-orange blush and tough, waxy skin. It has cream-colored flesh and a rich flavor, more sweet than tart, that develops in storage. It is good for cooking, especially in pies, and it stores well. The original tree, a cross of Golden Delicious and Jonathan, came from the farm of Ralph B. Griffith of Cobden in the 1960s. 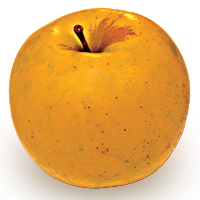 GoldRush is a late-season apple, medium-large, round to conical, golden yellow with an orange-red blush. It is crisp and juicy, with a complex, spicy, sweet-tart flavor that mellows over time. It is an all-purpose apple especially good fresh, in cider, and in salads, as it is slow to brown. It stores exceptionally well, and its trees are disease resistant. GoldRush was developed in 1973 in West Lafayette, Indiana, by PRI, the joint apple-breeding program of Purdue University, Rutgers University, and the University of Illinois. 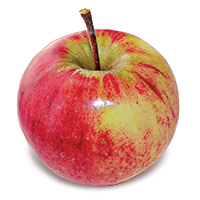 Its parentage includes Golden Delicious, Melrose, Rome Beauty, Siberian Crab, and Winesap. Released commercially in 1993, GoldRush was named Illinois’s official state fruit in 2008. Winter Banana is a large, round or boxy late-season apple with pale yellow skin and a light red blush. Its white flesh is crispy, aromatic, and moderately juicy, and it is considered better for fresh eating than cooking due to its mild, sweet flavor. It is also good in cider. It bruises easily, but stores reasonably well. Despite its name, most people do not detect any banana flavor; the apple’s name likely comes from its color. Winter Banana was discovered on the farm of David Flory in Adamsboro, Cass County, Indiana, in 1876, and released in 1890. Its parentage is unknown. While still grown in parts of the Midwest, its main use in New England is to pollinate other varieties. Red Delicious (Hawkeye), a late-season apple, is one of the most widely recognized apples in the world. Although its popularity has peaked, Red Delicious remains the most widely grown apple in the United States, and it is the most commercially successful apple of all time. It is known for its striking red color and distinctive, conical shape, and it ships and stores well. The trees are easy to grow and highly productive. 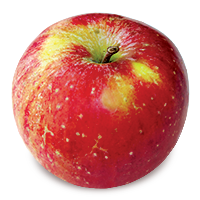 Sweet, lightly aromatic with crisp, cream-colored flesh, Red Delicious is an all-purpose apple. Its predictably sweet flavor often lacks character, though, becoming cloying or bland. Newer sweet apples like Gala, with its distinctive pear-like flavor, and other varieties that offer a broader range of flavors and textures have begun to erode Red Delicious’s dominance in the marketplace. Discovered on the farm of Jesse Hiatt in Peru, Iowa, in the 1870s, the apple was known as Hawkeye until 1893. It won an apple competition that year sponsored by Stark Brothers Nurseries. After biting into one, C. M. Stark is alleged to have said, “My that’s delicious — and that’s the name for it!” Hawkeye was reissued as Red Delicious two years later, in 1895. 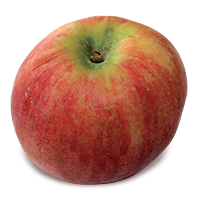 Stayman (Stayman Winesap) is a striped, cherry red, late-season apple with prominent lenticels and some russeting. It has tender, juicy, cream-colored flesh. Its balanced flavor is slightly more sweet than tart, with hints of honey, and it is highly aromatic. It resembles its Winesap parent (its other parent is unknown), but tends to grow larger, and its color is not as deep. It is an all-purpose apple that stores well. Stayman was discovered by Dr. Joseph Stayman in 1866 in Leavenworth, Kansas, and it was released in 1875. As it requires a long growing season, it is mostly a Southern apple, and it is not widely grown in New England. 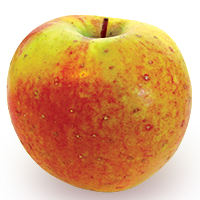 Opalescent (Hudson’s Pride of Michigan) is a large, mid-season apple with red overlaid on a yellow skin, with prominent white lenticels. Its coarse, yellow flesh is moderately juicy, and its mild flavor is more sweet than tart. It resembles Twenty Ounce, an heirloom from the 1840s, in size and looks, but its flavor is not considered as good, and it does not store well. 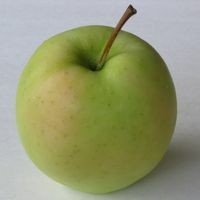 Once widely grown in New England, Opalescent was discovered by George Hudson in Barry County, Michigan, a cross of Golden Delicious with Newtown Pippin. Originally called Hudson’s Pride of Michigan, it was renamed when it was commercially released in 1880. Some sources trace its release to Xenia, Ohio, in 1899. PaulaRed is an early season apple, red with occasional light yellow or green striping and prominent white lenticels. PaulaRed’s tender white flesh is more tart than sweet, with a hint of strawberry. It is good for both cooking and fresh eating, and it is slow to brown, making it good in salads. It is also good in cider. Ripening in mid- to late August, it is one of the first apples of the New England season, but it is not available for long and it should be used soon after picking, as it does not store well. PaulaRed was discovered by grower Lewis Arends in Sparta Township, Michigan, in 1960, from a chance seedling near a block of McIntosh trees, and named after his wife, Pauline. 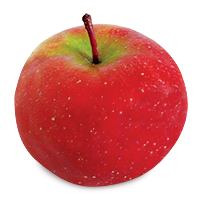 Its sweet-tart flavor and color suggest PaulaRed may have McIntosh in its parentage. It was released commercially in 1968. 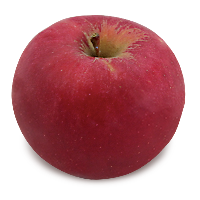 Maiden’s Blush (Lady Blush, Maiden Blush, Red Cheek, Vestal) is a medium-to-large, mid-season apple with a red blush and light striping over greenish-yellow skin. Its white flesh is crisp and juicy. More tart than sweet, with notes of citrus when first harvested, its flavor mellows over time and in storage. It is best used for cooking, drying, and in cider and wine making. Maiden’s Blush was introduced by Samuel Allinson of Burlington, New Jersey, in the late 1700s, of unknown parents. Once widely grown in America, it was especially popular in Philadelphia in the early 1800s. 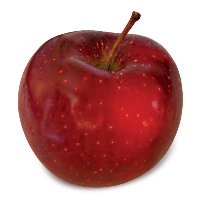 Winesap is a small, round, late-season apple, cherry red in color with a chewy skin. It has crisp, light yellow flesh, and is moderately juicy. It has outstanding flavor, more sweet than tart, with hints of cherry. It is an all-purpose apple, especially good for fresh eating and in cider. It stores exceptionally well. 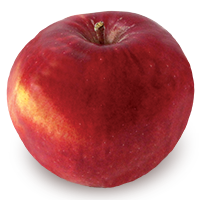 While some have suggested that it has a wine-like flavor, Winesap more likely was named for its deep red color. Winesap requires a long growing season, so it is mostly cultivated it in the South. It was widely grown in the South in the 1800s, especially in Virginia, and it remained popular until about 1950. Its decline resulted from its generally small size and the rise of controlled atmosphere (CA) storage, which made Winesap’s excellent storage qualities less important. Its age and origin are unknown, but Winesap was first recorded by Dr. James Mease of Moore’s Town, New Jersey in 1804, and it is generally thought to have originated in New Jersey sometime before 1800. Yellow Bellflower (Lady Washington, Lincoln Pippin) is a mid-season apple, medium to large in size, conical in shape, with lemon-yellow skin and a peach-colored blush. Its cream-colored flesh is crisp, juicy, and aromatic, and its flavor, more tart than sweet when picked, mellows in storage. It is best in cider and for cooking, especially in pies. It bruises easily and does not store well. One of the oldest heirloom apples from New Jersey, it was discovered in Crosswicks in the late 1700s, of unknown parents. It was not much grown in New England until after 1850. Its name may come from the fact that it hangs like a bell from the tree. 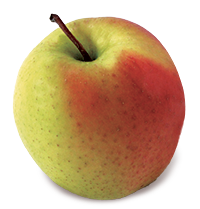 Blondee is a round, medium to large, mid-season apple with smooth, yellow skin and an occasional red blush. Its crisp flesh is moderately juicy, more sweet than tart, and a little spicy. It is good for fresh eating and in salads, as it browns slowly when sliced. It stores well. It was discovered on the farm of Tom and Bob McLaughlin in Portsmouth, Ohio, overlooking the Ohio River, in 1998. A sport, or mutant branch, from a tree with complex parentage including Kidd’s Orange Red and Gala, Blondee is now a trademarked variety. 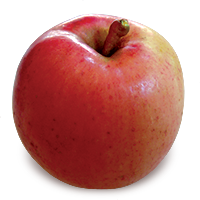 Holly is a large, conical or boxy late-season apple, with rich, pink-red color over a yellow skin. Its cream-colored flesh is crisp and juicy. Mostly sweet like its Red Delicious parent, it has a little tartness from its other parent, Jonathan. It is an all-purpose apple and a good keeper. Holly was developed by the Ohio Agricultural Research and Development Center in 1952, and released in 1970. Melrose is another Red Delicious-Jonathan cross, with markedly different results. It is a large, round, mid-season apple, yellow-green overlaid in red, with occasional russeting. Its coarse, crisp, white flesh is juicy, and its flavor, tart with a some sweetness when first picked, mellows over time. It is good for cooking, as it keeps its shape. The official state apple of Ohio, Melrose was discovered by Freeman S. Howlett at the Ohio Agricultural Experiment Station in Wooster in 1944. It is not to be confused with another apple of the same name (also known as White Melrose), a yellow apple attributed to the monks of Melrose Abbey, Scotland, around 1830. 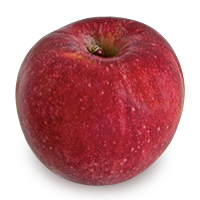 Rome Beauty (Rome) is a medium-to-large, round late-season apple known for its deep red color and excellent storage qualities. Its green-white flesh is crisp and juicy, with flavor that is more tart than sweet, and it has a thick skin. Rome Beauty is good eaten fresh but is used mostly as a cider apple and for baking, as it holds its shape well. A tree planted in 1816 by H. N. Gillet in Rome, Ohio, on the banks of the Ohio River produced a shoot from below the graft — the part of the tree that is not supposed to bear fruit. Growers generally trim these unwanted shoots off, but this branch survived to bear beautiful red fruit. It was introduced commercially in 1848. While its popularity has waned in New England in recent years, only one other apple on America’s top ten list, McIntosh, discovered in 1801, is older than Rome Beauty. Hidden Rose (Airlie Redflesh, Red Flesh, Schwartz) is a small, conical, late-season apple with light yellow-green skin and a pink blush. This sweetly aromatic apple has a pleasing tartness with hints of citrus, but it is not very juicy. Its dense, pink flesh is slow to brown, making Hidden Rose a good choice in salads. Due to its small size, it is mainly good for fresh eating, but it is used some in cooking, especially to color applesauce. In just half a century, Hidden Rose has already had several identities. It was discovered as a chance seedling in the 1960s on land owned by Lucky and Audrey Newell near Airlie, Oregon. Although they sent samples to Oregon State University, the variety remained unknown even after the Newells sold the property. In the 1980s, Louis Kimzey, the retired manager of a neighboring farm, rediscovered the tree, and gave it the name Airlie’s Redflesh (eventually shortened to Red Flesh). In the 1990s, several nurseries grew the apple locally under the name Schwartz. Kimzey and his former employer, Thomas Paine Farms, finally decided to commercialize the apple, and in 2001 they trademarked the name Hidden Rose. 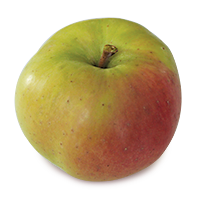 Hudson’s Golden Gem is a medium-sized, conical, late-season apple with light russeting over a green-gold skin. Its cream-colored flesh is crisp and juicy, and its outstanding sweet flavor has hints of nut and pear. An all-purpose apple, it is especially good eaten fresh and in cider. It stores well. Hudson’s Golden Gem was discovered in 1931 as a chance seedling along a fence at the Hudson Nursery in Tangent, Oregon. With its elongated form, bronze russeting, and evocative flavor, it was originally marketed as a pear. 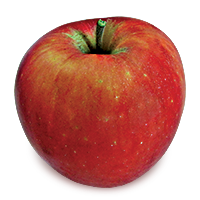 Smokehouse (English Vandevere, Red Vandevere) is a late-season apple, medium to large, round, mostly red with yellow highlights. Its cream-colored flesh is moderately crisp and juicy. Its flavor, sweet with some tartness, is on the mild side, often lacking distinction. It is primarily a fresh eating apple. It dates back to 1848, discovered on the farm of William Gibbons in Lancaster County, Pennsylvania, who named it for its proximity to his smokehouse. Smokehouse closely resembles Vandevere, a Maryland variety from 1806 presumed to be one of Smokehouse’s parents (the other parent is unknown). 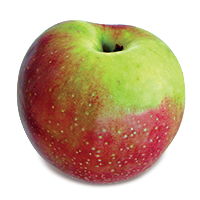 York (York Imperial) is a medium-to-large, often lopsided apple with red streaks covering a green skin. Ripening in mid-season, it has crisp, yellow flesh, and is moderately juicy. Its flavor, more tart than sweet when picked, becomes milder and sweeter in storage. It is good for both fresh eating and cooking, but it is mostly a processing apple due to its yellow flesh, which adds color to sauce and pies, and its small core. It is an excellent keeper. Discovered in York, Pennsylvania, in the early 1800s of unknown parentage, York is not widely grown in New England, but it is popular in Virginia and its state of origin. Ginger Gold is a medium to large, round to conical, early season apple with smooth, green-yellow skin and an occasional pink blush. Its crisp, juicy, white flesh is more sweet than tart. Ginger Gold is a good all-purpose apple, especially good in salads, as its flesh browns slowly when sliced. Ripening in late August, it has become an outstanding early season variety in New England, although its season is short. Ginger Gold was discovered in the orchard of Clyde and Ginger Harvey in 1969 in Lovington, Virginia, in the foothills of the Blue Ridge Mountains. Clyde Harvey wanted to name the apple “Harveylicious,” but cooler heads prevailed, and he chose his wife’s name instead. 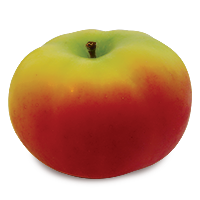 Ginger Gold’s parentage is uncertain, but it may include both Golden Delicious and Albemarle Pippin. 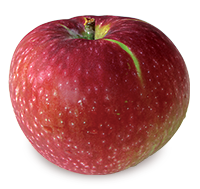 Cameo (Carousel) is a slightly conical, late-season apple with a thin, light-yellow skin with heavy red striping. Its flesh is crisp and juicy, and it has outstanding flavor, nicely balanced between sweet and tart. A chance seedling found by Darrel Caudle near Dryden, Washington, in 1987, Cameo may be a cross between Red Delicious and Golden Delicious. It was released commercially in 1998. 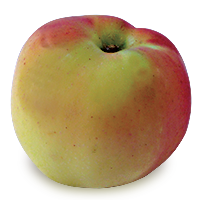 Golden Delicious (Mullins Yellow Seedling) is a medium-to-large, conical, late-season apple, golden yellow with an occasional pink blush and russeting around the stem. Its yellow flesh is crisp, aromatic, and juicy, and it has rich, mellow, sweet flavor, with hints of honey. It is an outstanding apple for fresh eating, and good in cooking, especially in pies, as its flesh holds up well when cooked. It has excellent storage qualities. 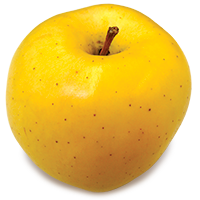 West Virginia’s official state fruit, Golden Delicious is one of the most widely planted apples in the world, and parent to a number of other varieties. But although it shares its conical shape and many flavor characteristics with Red Delicious, the two apples are unrelated. Discovered by Anderson H. Mullins near the town of Odessa, Clay County, West Virginia, in 1890, and originally called Mullins Yellow Seedling, Golden Delicious was renamed by Stark Brothers Nursery when it was introduced commercially 1916 in an effort to replicate Red Delicious’ success. It may be a seedling of Grimes Golden. 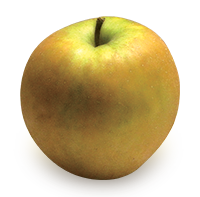 Golden Supreme is a medium to large, early season apple, conical, yellow with prominent brown lenticels and a pink-orange blush. Its cream-colored flesh is crisp and juicy, and it has a pleasant but mild flavor that is more sweet than tart. It is an all-purpose apple especially good for fresh eating, in cider, and in salads, as its flesh browns slowly. It stores well. Its age and origin are unclear; while generally credited to Clay County, West Virginia, some accounts say that Golden Supreme originated in Idaho. 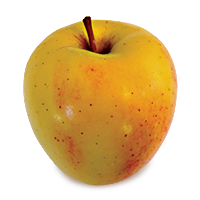 Grimes Golden (Grimes, Grimes Golden Pippin) is a medium round, mid-season apple, gold to deep yellow in color. Its yellow flesh is crisp, aromatic, and moderately juicy, and its flavor is nicely balanced, spicy, a little more tart than sweet. It is good for fresh eating and in cider. Grimes Golden dates back to the early 1800s, of unknown origin. It may be parent to a more famous apple also from West Virginia, Golden Delicious. Some accounts erroneously claim that Grimes Golden grew from seeds left by John Chapman (“Johnny Appleseed”), but Chapman planted orchards in only two states, Indiana and Ohio. Nevertheless, Grimes Golden is highly regarded in its native state. Wood from the trunk of the original tree (which blew down in a storm in 1905 after bearing fruit for more than a century) was used to make gavels for the West Virginia Agricultural Society. A portion of the trunk is preserved at West Virginia University, and a stone monument marks the site of the original Grimes Golden tree. 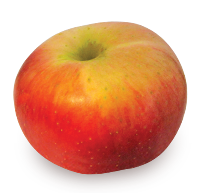 Wolf River is a large, bulky mid-season apple, often exceeding one pound. Its pale yellow skin is covered in red. Its coarse flesh is juicy, with mild flavor balanced between sweet and tart. It is best used in cooking and in cider. It does not store well. Its main distinction besides its size and lopsided appearance is that its trees are hardy and disease resistant. Wolf River was discovered on the farm of W. A. Springer Fremont, Wisconsin, in 1875 along the river that gave it its name. It closely resembles and is probably a seedling of the Russian apple, Alexander. NEW ENGLAND APPLE ASSOCIATION Executive Director Bar Lois Weeks and Senior Writer Russell Steven Powell will both be judges at the 6th Annual Great New England Apple Pie Contest at Wachusett Mountain’s 31st Annual AppleFest this Saturday, October 18. Judging will begin at 11 a.m.
For information about how to enter, visit Great New England Apple Pie Contest. 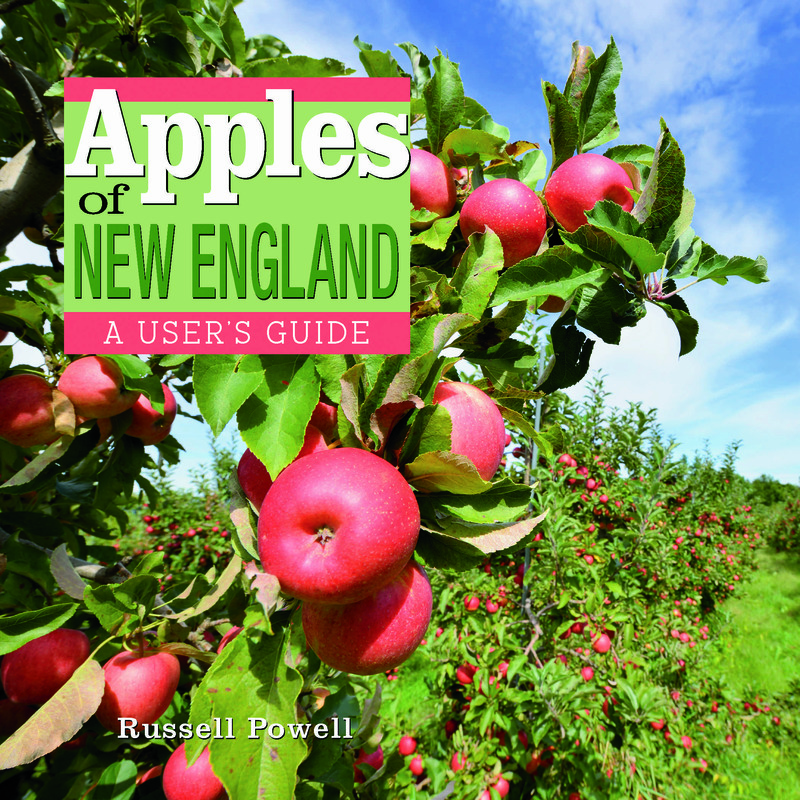 Powell will have copies of his new book, Apples of New England, and his first one, America’s Apple, available for sale and signing. Weeks took the photographs for both volumes, with more than 200 apple varieties discovered, grown, or sold in New England illustrating Powell’s text in Apples of New England. AppleFest will continue on Sunday.